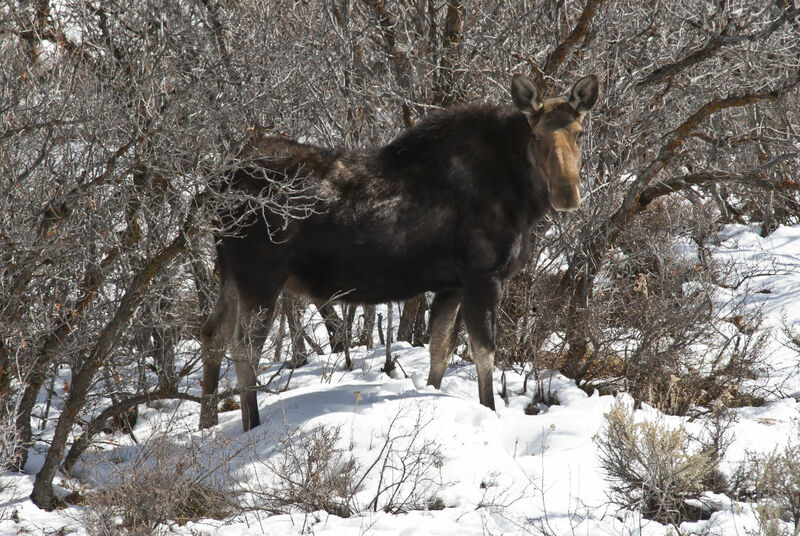 Moose are frequently spotted in and around Park City, but they're not likely to be friendly if you get too close. If you've spent any time of Park City's trails, you've probably spotted a moose or two. Around these parts, moose are even known to wander into town to take a stroll down Main Street (much to the delight of out-of-town visitors) or attack local gardens. Presumably, most people who live here know how to handle themselves around these notoriously irritable animals, but it's always worth mentioning again for those of us who just can't seem to help wanting to get closer. Don't get between a mama moose and her calves. If you happen upon a female, be extra careful to assess the scene in case she has little ones nearby. Baby moose are vulnerable to a number of predators, including cougars and bears, so mothers won't hesitate to aggressively defend their young. Just like other animals, moose have their way of telling you they're feeling threatened. An angry moose will likely pin its ears back, lower its head, or raise the hackles along its shoulders. If the moose starts moving towards you, it's a crystal clear message for you to run and get under cover if possible. Usually, if you stay well away from them, moose will simply run away or eye you suspiciously as you pass. A stressed, cornered, or harassed moose, however, might decide to charge. Bull moose are more aggressive and particularly dangerous in September and October during the mating season while cows get prickly during the late spring during calving season. Should a moose decide to charge you, your only option is to run and take cover. Moose can reach speeds of 30+ m.p.h. so you probably won't outrun it for long, but at least you're not going to trigger a predatory response. Your best bet is to try find some kind of cover or climb up a tree if you have time. If the moose catches up and knocks you down, curl into a ball, cover your head as much as you can, and don't move until the moose leaves. Getting up might make the moose think you're a renewed threat. Remember, if you provoke a moose, you're setting yourself up for a loss since they're much bigger and more dangerous than you. Best to make some noise, stay away, and let it go about its day.